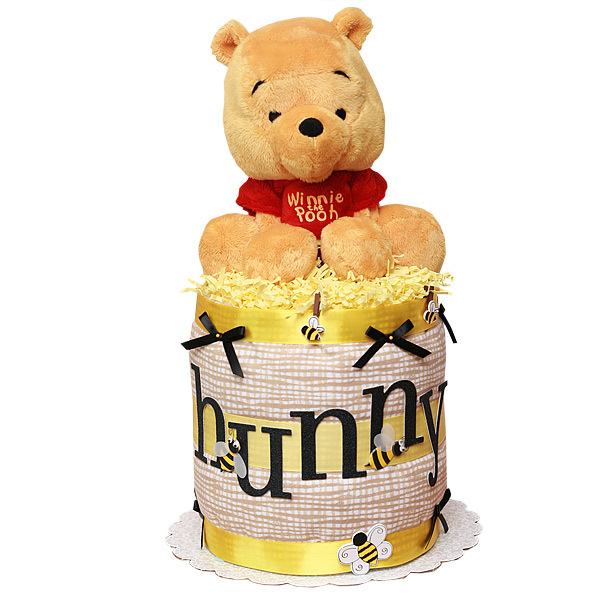 A fantastic gift for any new mom, one tier Winnie the Pooh Hunny Pot Diaper Cake! Very simple and fun design. This diaper cake can be a gorgeous centerpiece for your Winnie The Pooh themed baby shower. The diaper cake is made of 30-35 Pampers Baby Dry diapers size 3 (16-28 lbs. ); one flannel receiving blanket 100% cotton; one baby bottle; one plush Winnie The Pooh toy; scrapbook and wooden embellishments. The diapers are held together by elegant ribbons (no glue on diapers). Ribbons are hand-stitched with white embroidery floss on the back of the cake, allowing for a clean, handmade look. Decorated with ribbons, bows and crinkle paper.